All winter long I’ve been giving thanks for how healthy our family has been. Truly, we’ve been incredibly blessed in that no one has missed a single day of school or work due to illness in a very, very long time. In fact, it may have bordered on obsessive or even prideful how focused I’ve been on our sickness-free state. I’ve been practically Bible-thumping Psalm 91, which says, “You will not fear…the pestilence that stalks in the darkness, nor the plague that destroys at mid-day. A thousand may fall at your side, ten thousand ten thousand at your right hand, but it will not come near you.” Hear that, sickness? You’re not coming for ME! And then, over the weekend, I came down with a raging case of the flu. Meh. As a nutritionist, I’m often challenged to practice what I preach when it comes to my own diet and its effect on my health. My everyday struggles include sugar intake, getting enough fruits and vegetables, and cutting back on processed foods. But when I’m sick, I feel I really have to step it up a notch with my diet. The last couple of days, when I’ve managed to drag myself out of bed to eat something, I’ve given a lot of thought to what that something should be. And since I’m laying around, not doing much except scrolling through Facebook and streaming The Man in the High Castle from sources of dubious legality, I thought I’d share some knowledge about which foods can help fight cold and flu and get you back on your feet–and which foods are best to avoid. Here are seven evidence-based food choices to boost your immunity and help your body heal from whatever is going around this time of year. Food as medicine is real! Since the body’s response to infection with cold bacteria or a flu virus is to mount a defense by creating inflammation, reducing that inflammation can bring relief of symptoms. Numerous studies have shown ginger to have anti-inflammatory properties, so including it in your diet can help you feel a little more human. Steeping a piece of peeled ginger in hot water for a few minutes to make a ginger “tea” is an easy, direct route to ingest this healing spice, or you could knock out two categories of cold-busting foods by trying a ginger-spiced chicken soup or ginger-veggie stir-fry. For centuries, garlic has been used as an antibacterial, anti-fungal agent. While its exact mechanism for immunity isn’t perfectly understood, one theory is that it helps the body produce hydrogen sulfide, which allows for better blood flow, thus circulating more of those helpful white blood cells that fight disease. Regardless of the reason, at least one study showed that taking garlic supplements reduced the duration of the common cold. Experts recommend that garlic be eaten raw, rather than cooked, for maximum benefit. Allow me to suggest this True Food Kitchen Kale Salad for a delicious way to get raw garlic in your diet. There is some controversy over the effectiveness of echinacea, since research is not 100% conclusive about its benefits for colds and flu, but for my money, enough evidence exists to support its use. One review of 14 clinical trials showed that taking echinacea in some form reduced the duration of the common cold by 1-4 days. As always, consult your healthcare provider to find out your appropriate dosage. You can check out this post for some in-depth info on turmeric, but essentially, like garlic and ginger, turmeric has been shown to contain anti-inflammatory compounds. If you’re feeling adventurous, you can find tons of turmeric smoothie recipes online, or, if you have a really awesome spouse/roommate/adult child who’s willing to cook for you while you’re sick, have them make you some of these Spiced Red Lentils for a wholesome, healing, turmeric-infused meal. There’s really something to the tradition of chicken soup for fighting illness. A study was conducted at the University of Nebraska in which neutrophils, the white blood cells that fight infection by producing inflammation, were exposed to chicken broth. This exposure slowed their activity, suggesting that the broth may slow the inflammatory process. (Wait, what? Blood cells exposed to chicken broth? Who funds these studies??) Weirdness of this study aside, its results are pretty intriguing. Once again, probiotics save the day! Yogurt and other fermented foods (like kefir, kimchee, sauerkraut, and pickles) contain the kinds of good bacteria we want in our digestive system. Because of the interaction between gut flora and the immune system, filling your belly with probiotic-rich foods is a great way to strengthen immunity. 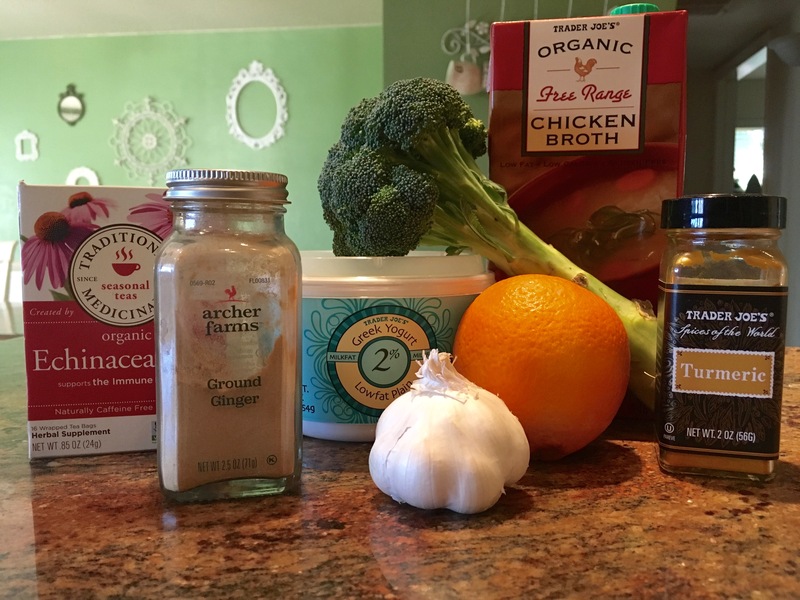 And finally, while we’re on the subject, lemme sneak in some words to the wise on the flip side of this coin: what NOT to eat when you’re battling colds and flu. Added sugars, processed foods, and alcohol are all on the Naughty List when it comes to your immune system. (In your regular diet, alcohol in moderation is not a problem, but because of its dehydrating effect, it’s best to steer clear when you have a cold or flu.) Stay away from these no-nos for best results in your immune-boosting regimen.